Our Youth area offers a wide variety of programs to keep your child active. They will have the opportunity to improve their social skills, gross and fine motor skills, balance and coordination and independence. Our programs promote an active, fun and healthy lifestyle, and your child will create memories and friendships for a lifetime. For more information or questions, contact M-NASR at 847-966-5522 or see the current brochure. This community-based sports program allows family members or peers from the community a chance to play together. We will pair up a M-NASR athlete with a buddy volunteer during practice and game time. This gives everyone a chance to experience a complete sports activity in a fun noncompetitive atmosphere. Calling all Maine Township Students… Are you looking for fun two days a week? M-NASR offers afterschool programs twice a week for school-age children. Activities may include cooking, science, art, sports and outdoor activities. M-NASR offers an action-packed Saturday Lineup including bowling, snacks, games and swimming. Choose one, two or all three of these programs to custom-fit your Saturdays. Transportation between programs is provided. School may be out but M-NASR is in! Whether at an all-day (9:00 a.m. - 3:00 p.m.) special event or at spring and sinter break camps, your child will enjoy his or her time away from school in a fun, structured environment. Our staff will work with your child to stay safe and active in an engaging atmosphere. M-NASR offers social clubs each season for our participants. Social Clubs such as Young Adult Club offer our participants a great opportunity to transition slowly from Teen to Adult programs. For more information about Social Clubs, please contact us at 847-966-5522. Each season we will offer a variety of special events out in the community. These one-day events may include holiday activities, trips to the city, sporting events, theater/concerts, water parks and much more! Looking for a way to allow your teen to grow independently? M-NASR offers several overnight trips each year. 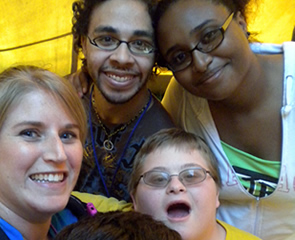 These trips focus on self-help skills, independence and socialization. Past overnight trips have included camping, going to the Wisconsin Dells and Great America. Trips typically last two to three days and are a highlight of the season. Friendships and memories made will last for years to come!